If you share ownership in your business with one or more other persons or parties, then ultimately your ability to successfully exit is likely tied to their ability to successfully exit. Without alignment, you and your co-owners may find yourselves rowing your mutually-owned boat in different directions. When should co-owners start their exit planning? Why should co-owners get exit-planning assistance from outside advisors? What if the co-owners are related to each other? What if one or more of the co-owners do not actively work in the business? What if one of the co-owners is an institution? What if someone is not actually a co-owner, but is being treated as a co-owner? What if the co-owners are struggling or resistant to talk about these matters? What if the co-owners are not getting along with each other? 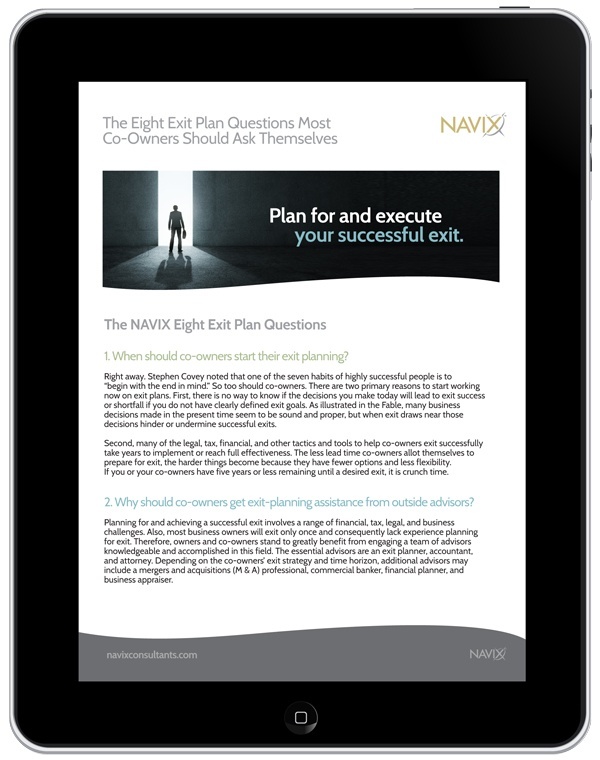 The answers to these eight questions may help you and your business co-owners approach your exit planning needs, and achieve a successful exit.